Wearlon® provides a non-stick coating that adds lubricity to nearly any surface to decrease build up and lower maintenance costs. Clean up is faster and easier. Super F-3M has tremendous water shedding properties and is spectacular in its hydrophobic properies, even approaching that which is achieved with paraffin wax. 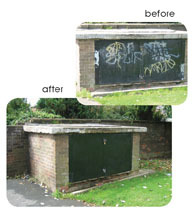 Our Wearlon® Anti-Graffiti Coatings protects surfaces from graffiti vandals. An epoxy-silicone, three component, water-based, room temperature cure coating. The Wearlon coating with its slick surface resists spray paint, marker, pen, pencil, blood and most stain causing products thereby deterring the vandal. Clean the surface with soap and water or mild house hold detergent and a nylon brush, unlike other anti-graffiti coatings that require harsh toxic solvents. Available in different varieties to match your application; Transparent, UV Resistant and Extremely Hard. Most graffitied surfaces may be wiped clean with a damp sponge. For surfaces that have been spray painted or permanent markered, we suggest using a mild alkali detergent while scrubbing with a nylon bristle brush. Conventional household cleaners are also quite effective at removing stains. For large areas, a power brush spray system with a diluted alcohol water solution or mild conventional paint thinners such as mineral spirits is recommended.